Investigate phenomena that demonstrate the physics of the universe, and for older students, find out how astronomers find black holes, exoplanets and dark matter. Tell students that they will experiment with physics and find out how astronomers use the same physics to understand the universe and discover new objects in it. Depending on the age, do all or a selection of the activities. Explain how astronomers use the same physics to understand the universe. Then come back down to Earth to make a balancing sculpture, which works by the same principles of balance and centre of mass, as objects in orbit together. Suggestion for intermediates: three stations to rotate through - gravity well (how black holes are discovered), coupled orbits (how black holes and exoplanets are discovered, and why astronomers are looking for Planet 9), gravitational lensing (how dark matter and cosmic background radiation are mapped, how galaxy clusters and early universe galaxies can be studied). Then balancing toy all together. Suggestion for primaries: two stations to rotate through - gravity well (how black holes are discovered) and coupled orbits (how exoplanets are discovered). Then balancing toy all together. Suggestion for kindergarten: gravity well all together (discuss orbit shapes of our moon and planets). Then balancing toy all together. 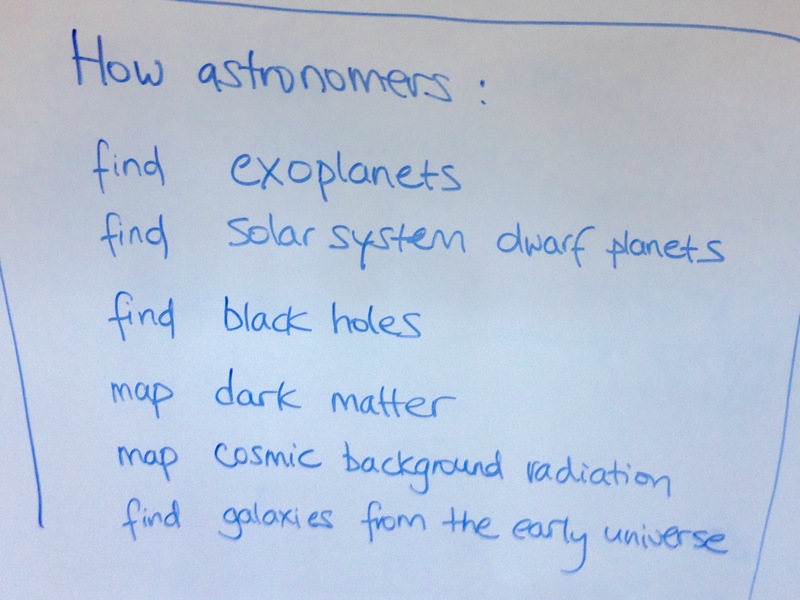 Similar selection of activities to the Black Holes lesson, but with a broader message.